If you missed the episode... what do you think you are doing reading this article???? Follow this link if you need to see the episode, or want a recap. Sorry folks I think the BBC iPlayer will only work in the UK. I really loved the way we were thrown straight into tonight's episode.... and with a relentless pace that just carried right on through to the dying moments. I also loved the welcome return of so many old faces. You get the impression from all that went on, that we only have half the pieces to the puzzle... that there's a lot going on we don't even know about yet. I get the impression that next week's finale is either going to be very very good... or very very poor. It obviously looks like there is going to be a regeneration... but as Mark Twain said: "Never make predictions... especially about the future". 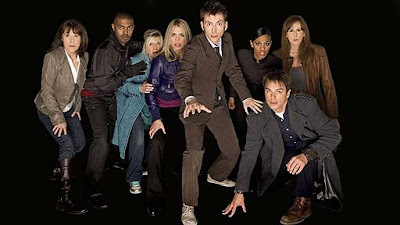 The ending interrupted the regeneration process, which left us in the annoying position of having a triple cliffhanger. My suspicion is that whatever happens, the device that Martha holds... the Osterhagen key, will be some kind of Deus Ex Machina... something that will alter the events that lead to this regeneration being altered. However, I hope in some ways that I am wrong... because that would make it all too similar to last years conclusion... and Doctor Who is not Dallas. It shouldn't rely on everything always being... just a dream. 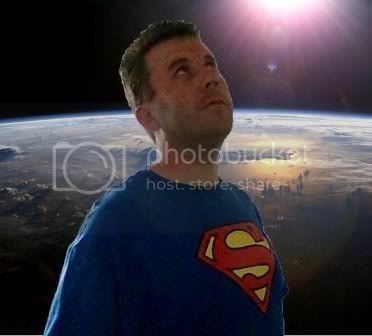 By the way "Osterhagen" is an anagram of among other things, the phrase "Earth's Gone". For an atheist, Russell T Davies seems to explore the idea of sacrifice and resurrection quite a lot... he's done it a lot in Doctor Who, as you can probably tell from other episodes I've blogged about. Let's see where next week takes us. 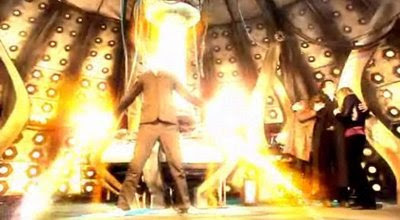 What is going to happen with this regeneration? Will Sarah Jane, Ianto and/or Gwen survive? Just who or what is inside the Supreme Dalek? What other effects has Caan's trip to the timelocked "Time War" had? What is the Osterhagen Key and what will happen if it is used? Is someone going to make a supreme sacrifice (certainly seems possible given the title)? Most importantly all... did anyone try and contact the Doctor using 07700 900461? If you think you know what is going to happen,I'd love to hear your comments. Heck knows! David Tennant will be back though I hope! 07700 900461 is an unreachable number. The area code is set aside for use in TV and so on like the 555 prefix in American films. Well the rumours of two 10's running around everywhere are growing in substance. Sneaky fans who have been observing the filming and posting about it, have noted the presence of a brown suited Doctor and a blue suited Doctor. I figured that number was set aside for TV purposes... much like Penny's number was for the Lost episode "The Constant". It would have been nice if they'd pulled a real number leaving a message "This is the Doctor, thank you for trying to contact me... unfortunately I am in the middle of a galactic crisis and can't speak to you now. However if you would like to, you can leave a donation for "insert charity" by doing the following etc..."
It would be a nice way of rewarding the fans and raising money for a good cause. Begs the question Benny... did you actually try it? Heh! No, I didn't actually try the number. Out of curiosity I googled it though lol. Apparently, Ofcom sets aside ranges of numbers for TV purposes. There are probably regulations surrounding the use of 'real' numbers on TV in that they have to let the caller know of any charges involved beforehand. I guess the makers of Dr. Who didn't want to complicate things by using a real number on the show, especially after recent stories regarding unwinnable phone-in quizzes.